Decorating your home for the holidays doesn’t have to be a burden. There are tips and trends that can help make the experience enjoyable. It’s that time of year again. Time to get toasty under a soft and cuddly throw as you relax with a nice cup of hot chocolate (or wine) and sit back and soak up the magical ambience of the holiday atmosphere in your home. A holiday environment, mind you, brought to life with your admirable and brilliant decorating skills. Wait, you might be saying. I would love if that vision were my reality. But I don’t even know where to begin when it comes to holiday decorating. I’m usually sitting there unwinding a tangled box of lights and unpacking a box of ornaments as I feel overwhelmed with the whole process. So, I never really attempt to broaden my decorating horizons. Well, we’re here to help! Read on for a few tips and tricks courtesy of our region’s experts. Their advice is sure to help you take your home from dull to dazzling this holiday season. There are a few things to remember when decorating for the holidays. For starters, don’t limit the areas in which you choose to decorate. Some people may have a fear of overdoing it, but let go of that worry. Simply hanging up lights around the outside of your house may be a tradition that has worked for generations, but you can take things further and still prevent your home from looking like Santa’s workshop (unless you want it to, of course). These days, less is more when decorating. Batson also enjoys placing Christmas trees in her kids’ rooms, and she lets them pick a Christmas figure or plaque for their rooms to help them get in on the holiday decorating spirit. In the kitchen, work with items as simple as holiday-themed tablecloths and napkins. Even using plain, but versatile linens will turn out nicely. Spaces such as tables, mantles and porches can also use bits of holiday cheer and shouldn’t be overlooked. In your porch space, hang garlands of leaves and elegant seasonal wreaths; arrange wire or woven baskets filled with glittered gourds, pumpkins, pinecones and greenery; or, set out trendy interchangeable pieces, such as do-it-yourself wood pallets with painted fall scenes on one side and winter scenes on the other. Candles, glittery ornaments and metallic vases are easy-to-find items that add little bits of shine to a home. Strategically placed candles on a mantle or table give off an inviting, cozy glow as they fill rooms with lovely scents – perfect for setting the holiday mood. If you want to create additional warmth, try mulling spices on the stove or making your own do-it-yourself potpourri blend. Decorative trays are also an option. Let’s not forget how flowers can bring so much life and beauty to a space. Seasonal flowers, greenery, branches and mistletoe can add a special sort of vibrancy to your decor. In the transitional time around late fall and Thanksgiving, plants such as mums make ideal decorating choices when paired with and dried accents like pods, wheat, gourds and squash, says Marcy Cronin, of Countryside Flower Shop, Nursery & Garden Center in Crystal Lake. “Broom corn, gooseneck gourds, mums, heather, kale and dried seed pods can really showcase your home in fall,” she adds. During the holidays, popular choices are fresh greens, pinecones and lanterns. Planters filled with fresh evergreens, pinecones, magnolia leaves, decorative branches and berries can beautifully accent a front door as easily as the rooms inside your home. Poinsettias are always a holiday favorite, and at Countryside they come in a wide variety of colors and sizes. Don’t be afraid to add touches of whimsical elements when it comes to holiday decorating. After all, the holidays are supposed to be all about family, fun and magic. Children tend to look at this time of year with an enchanted sort of wonder. As adults, we can also find that special wonder and magic again – if we choose to do so. Other ideas can include fun projects such as illuminated winter scenes in mason jars or incorporating the popular Elf On the Shelf doll into your decor. This toy “magically” changes position during the season, in order to keep a watchful eye on children’s good behavior and report back to Santa. Not feeling very crafty? When it comes to finding ready-made holiday decor, local merchants can help you to brighten up and stylize your home for the holidays. Meyn says her shop also has a unique collection of seasonal item that, when combined, create a holiday look like none other. There are always a few trends that sweep in each holiday season to give homeowners and shop owners alike a new, fresh way to decorate their spaces. This year, bigger is definitely better, says Kelsey Haas, co-owner of Strawflower Shop and Rug Merchant in Geneva. Expect to see larger ornaments on showcase, especially on Christmas trees. 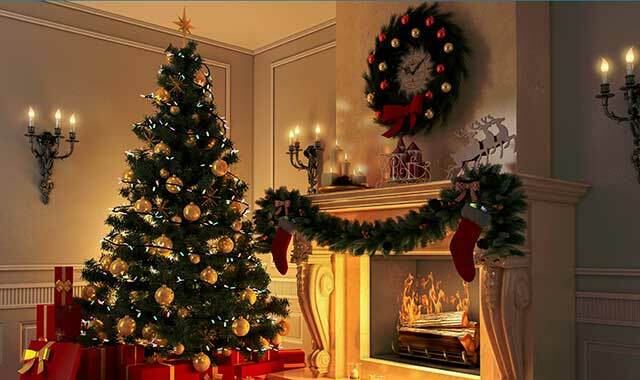 Large ornaments give a tree depth. It’s actually an easy style to pull off, Haas says. “Bigger ornaments are easier to do because they take up more space in the tree, so you don’t have to use as many,” she says. Many holiday manufacturers are also referring back to a more natural look that blends well with traditional decorations, Haas says. For example, you’ll still see ribbon decoratively draped on Christmas trees, but you may also see slightly worn silver tin wrapped around the branches as well. Perhaps the easiest trend this year is to stick with traditional Christmas colors. This entry was posted on Friday, November 3rd, 2017 at 12:00 pm	and is filed under Home & Garden, Top Posts. You can follow any responses to this entry through the RSS 2.0 feed. Both comments and pings are currently closed.